When Isaiah writes his prophecy, he reveals two major truths to the Israelites. The first truth is a message of judgment. The Israelites are wicked and need to repent. God is sending them into Babylonian captivity to cleanse them of their wickedness. The second truth Isaiah brings to the Israelites is a message of hope. After cleansing His people, God will rescue them from captivity and bring them back to Zion. God delivers them in the hands of Babylon, and He is the One who brings them back to Israel. He once again delivers His people, just like the deliverance from Egyptian captivity 775 years earlier. These truths are multi-layered. They don’t just apply to the Israelites in Isaiah’s time. We can read these chapters and apply much of what Isaiah says to our lives. The truth written by Isaiah is timeless. We can read today and be encouraged by God’s character. God’s grace and forgiveness are timeless. God’s judgment of sin is timeless. God’s saving His people is timeless. There is a layer of truth that applies to the Israelites in the 7th-century bc, and a layer of truth applying to us in this 21st century. Isaiah’s prophecies are multi-layered in that they have a near and far element. For example, we read of the “near” prophecy of the virgin giving birth during the time of Isaiah (Isaiah 7:14) which we also know is the “far” prophecy of Jesus’ virgin birth 700 years later. There is the near prophecy of God bringing people from Babylon to Jerusalem after their captivity, and there is the far prophecy of God bringing all His people to the New Jerusalem at the end of the age. Because of the multiple layers, reading Isaiah may be confusing and, at the same time, incredibly satisfying in its complexity. We may not approach the wisdom of God casually. As we look at Isaiah 57:12, we will see it is multi-layered. The passage applies to the Israelites after their release from captivity in Babylon. The passage describes how God expects the Israelites to respond to their salvation. Isaiah 52:7-12 applies to us. The writers of the New Testament use this passage to inform us of how God expects us to respond to our salvation having been released from being slaves to sin and death. There are expected responses to events in life. We expect the bride and groom to be deliriously happy at their wedding. In hearing about death, we expect people to exhibit sorrow and grief. Isaiah 52:7-12 describes how God expects the people of Israel to respond after He sets them free from Babylon. God’s salvation requires a response. The response God expects from the Israelites is no different from the response He expects from us when He saves us from eternal condemnation. The main idea of the passage is that we are to endeavor to respond to God’s saving work according to His word of truth. The Scripture describes for us the way we are to respond to God’s saving work. In this passage, we read of five ways we are expected to respond. God promises to rescue the Israelites from Babylon. The first expected response is that the Israelites will herald the good news of their salvation. Messengers that come from afar travel across mountains to bring news, both good and bad, from faraway places. Isaiah does not say, as we might expect, how lovely are the lips or how beautiful is the voice that brings good news. Instead, Isaiah says how lovely are the feet. The expression is lost in our culture. In eastern cultures, feet are a vulgar part of the anatomy. Feet are dirty from the filth of the world. In ancient times, the feet have callouses and bunions. Today, in eastern cultures, to sit in such a way that the soles of your feet point in the direction of someone else is a vulgar insult. When Jesus washes the feet of His disciples, it is an act of service reserved for the lowest of servants. It is impossible for the feet of those who announce peace, happiness, salvation, and that God reigns to be ugly feet. They are lovely feet soaked in the most expensive of oils and perfumes and adorned with the choicest of jewelry. The time of the Israelites fighting is over, and the feet of those announcing peace are lovely. They bring the good news of happiness. No more sorrow or crying. It is the end of gloom, misery, and sadness. The reason for peace and happiness is that God saves the Israelites from their captors. He redeems them from destruction. God reigns as King of kings and uses His authority on behalf of the Israelites. Their enemies do not prevail. God shows Himself victorious. Israelites are the beneficiary of the Lord’s reign. Everyone loves to share the good news. God will not have to twist the Israelite’s arms to get them to share the good news. It is impossible to keep good news a secret. They will run from house to house proclaiming the good news. We are free! We are free! God saves the Israelites from Babylon captivity and God expects they will herald the good news. God expects us to herald the good news. Jesus ends all war, strife, fighting, and conflict. God saves us from being captives in the domain of darkness. Jesus gives us peace with God. We are no longer God’s enemies and we need not fear His wrath. We enter into perfect happiness because Jesus reigns and sits on the throne. He is supreme over all as the King of kings and Lord of lords. His Lordship sets us free from sin and death. Jesus removes our sorrow and despair and fills us with joy and hope. In the same way, God expects the Israelites to spread the good news of salvation, God expects us to proclaim the good news. 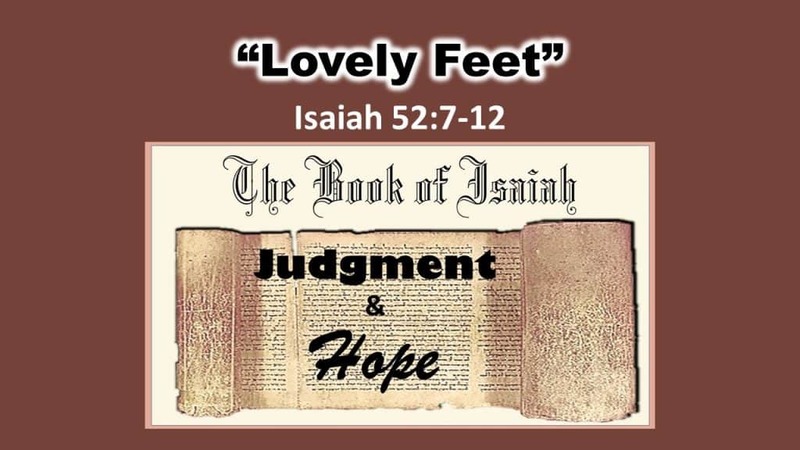 Listen to how the Apostle Paul applies Isaiah 52:7 to the Christian. Paul begins by stating the truth that everyone who calls on the name of the Lord will be saved (Romans 10:13). After making that statement, Paul asks three questions to awaken the ear of his readers. He desires for the reader to think critically. Paul knows the answers. As a Greek scholar, he is using the Socratic Method of asking questions to guide the reader to the right conclusion. How will they call on Jesus if they don’t believe in Him? If they don’t believe in Jesus, they will not call on Him. And how can they believe in Him if they have never heard of Him? They cannot believe in Jesus if they have never heard of Him. And how are they to hear of Jesus unless someone goes and preaches Jesus to them? They cannot hear unless someone speaks. There is only one conclusion to Paul’s questions. The conclusion is that nobody will call upon Jesus for salvation unless someone first goes and tells them the good news of the Gospel. Paul justifies his theological conclusion with Old Testament Scripture[i]. He writes, “As it is written, “How beautiful are the feet of those who preach the good news!” (Romans 10:15). Paul gives the biblical justification to herald good news of Jesus to those who have not heard because this is what God expects of His people. God and the world each have a definition of loveliness. Which loveliness will we pursue? Will we spend time on our outer worldly loveliness? Or will we spend time on being beautiful in the eyes of God? God’s definition of loveliness is that those who preach the gospel are lovely from the top of their head to the very soles of their ugly, stinky, calloused, dirt-encrusted feet. Endeavor to respond to God’s saving work by being a herald of the good news of the gospel. The second expectation God has for His people is that they will break forth in joy. Watchmen are those who look beyond the immediate area and tell people what is coming. They typically warn the city of danger. The watchmen see the Lord is coming. They raise their voices shouting joyfully together. The people hear their joyful shouting and they join in. Everyone knows what is happening. God is moving into waste places and restoring them, so they will produce abundant crops. The places once devastated by Babylonian armies and the lack of rain become productive fields of harvest. Hunger is met with clusters of grapes and olives for oil. Sheep and cattle graze on the green grass of the luscious fields. Polluted streams and rivers sparkle with clean water. As the waste places transform, God redeems His people. Imagine being captives in a foreign land. The food, language, customs, and attire are all foreign. They lose their national identity. God comes and rescues them and sends them home. They will sleep in their homeland and not in a strange place. They will no longer have to constantly look over their shoulder as they live under the tyranny of their oppressor. The afflicted find comfort. The oppressed are set free. There are dressing and salve for wounds. Mourning and sadness dissipate. Heartache and sorrow become shouts of joy. When God releases His people from Babylonian captivity, there is an expectation of joyful celebration. God releases us from captivity. Our freedom is far greater and more glorious than the release of the Israelites from Babylon. Our redemption is purchased with the blood of Christ, God’s beloved Son. We are no longer slaves to sin and death. We have the promise of living as the children of God. We are free in Christ. We are given the promise of eternal life in the Kingdom of God where there is no pain, sorrow, tears, or death. God’s expectation for us is that we also great joy. Thankful people are joyful people. The New Testament is filled with descriptions of the joy for the believer who puts their faith in Christ. John 15:11 These things I have spoken to you so that My joy may be in you, and that your joy may be made full. The writer of Hebrews tells us that we are to look to Jesus, the author and finisher of our faith, who for the joy set before Him, endured the cross, despising the shame (Hebrews 12:1-2). Amid great difficulty and sorrow, we are to look for joy. Joy is the fruit of the Spirit of God indwelling in us. The freedom we receive in Christ results in the presence of joy in the life of the believer. Endeavor to respond to God’s saving work with a heart, breaking forth with joy. The reason for heralding the good news and to break forth in joyful shouting is God’s intervention on behalf of the Israelites. The third expected response is knowing the source of salvation is the result of God baring His holy arm. In Isaiah 51:9, the Israelites cry out and pray for the “Arm of the Lord” to be awakened and to put on strength. God’s holy arm reaches out from heaven and intervenes on behalf of the Israelites. God bares His holy arm so that all the nations know of God’s work to free the Israelites. God uses Cyrus of Persia as an instrument to release the Israelites from Babylon. It is Cyrus who sends out an edict to all the world to speak of the greatness of God. God expects the world to know that His holy arm brings salvation. God expects us to know that the reason for our salvation is that God bares His holy arm. The Old Testament teaches that God’s holy arm is Jesus Christ, the Messiah. The next chapter speaks of the Suffering Servant as the arm of the Lord. God expects Christians to proclaim that His holy arm brings salvation. We are to proclaim that the Lord’s salvation is found in Christ alone. As we herald the good news, we need people to see the holy arm of the Lord. People look everywhere for salvation. People put their faith in their good works to save them. They put their faith in higher education or in filling their bank accounts. People put their faith in their careers or their families. These things are not bad, but they will not save us from the wrath to come. There is only one thing that saves people from the wrath of God. Our only hope is to put our faith in God’s salvation, which is to put our faith in Jesus Christ for the forgiveness of sins. Endeavor to respond to God’s saving work by putting your faith in the arm of the Lord to save us from our sins. The fourth response God expects from the Israelites is that they will not stay in Babylon, but will depart. When God saves His people from captivity in Babylon, He wants them to leave. The chains are loosened so that they may go freely back to Jerusalem. As they depart, God wants them to be holy. They carry the vessels of the Lord. The vessels are the instruments used to worship God in the temple. They are the bowls for washing and the lamps for light. Babylon is unclean. They are to leave Babylon because it is a place of false worship and false gods. They are to remain spotless as they depart. God expects that we also will depart Babylon after we are saved. We are told that we cannot be friends of God and friends of the world. We live in the world, but we cannot be of the world. The Apostle Paul quotes Isaiah 52:11 when he writes to the church in Corinth. In these verses, Paul teaches that we are not to take part in the world’s sin. We are to be separate. It is a ridiculous notion to think of Jesus existing harmoniously with a false god. In the same way, our participation with those who commit deeds of darkness is just as ridiculous. We are not people who carry the vessels of the temple. Paul says we are the temple. Paul quotes Exodus to prove that we are temples of the living God. And, if we are temples, how much more are we to be separate and holy than those who carry vessels of the temple! God’s people in all time are to live lives holy and set apart. We are to imitate our Father in Heaven by seeking righteousness and holiness. Endeavor to respond to God’s saving work by purifying yourself from the world. Fifth, God expects His children to follow Him in faith. As they depart Babylon, they are to leave in the open and with boldness. They don’t have to leave in stealth-mode, being afraid of their enemies. They are to go with confidence. There is no need to rush. The reason is that God goes before them and behind them. God is the guard. He leads them in the right direction, and He follows behind to make sure every last Israelite makes it safely. There are no stragglers who are lost. We are to follow Christ in the same way. We are to follow in faith. We are to leave the world behind and follow Him with boldness and courage. He leads us. Matthew 10:38 And he who does not take his cross and follow after Me is not worthy of Me. The rich young ruler (of Mark 10:21) does not have confidence in following Jesus. His confidence is in his riches. He is not willing to let go of the world. He wants eternal life and he wants to hold onto this world. Revelation 14:4 These are the ones who follow the Lamb wherever He goes. These have been purchased from among men as first fruits to God and to the Lamb. Jesus desires we follow Him with complete confidence. He is leading us into His kingdom and He wants us to hear His voice and to follow His ways. The Israelites have the Lord as their rear guard to make sure they make it into the kingdom. We also have a rear guard. God gives us His Holy Spirit as the guarantee of our success in following Christ into the kingdom of God. All who possess the Holy Spirit are guaranteed to receive the kingdom of God. God’s Holy Spirit is the guarantor of our kingdom inheritance. Endeavor to respond to God’s saving work by confidently following Jesus in faith. God expects us to respond to His work of salvation. We are to endeavor to respond to God’s saving work according to His word of truth. This passage reveals five ways we are to respond to our salvation. God expects for us to herald the good news of peace and happiness and that our God reigns. We are to break forth in joy knowing we receive all things in Christ. As we herald the good news and when people ask us about our joy, we are to point to the cross as the only way of salvation. We are the temples of the living God. Therefore, we are to purify ourselves from this world. And, we are to follow Christ in faith knowing that He is leading us into His kingdom. When we respond in this way, we will find purpose and meaning in life. We will live as beacons of hope in a world filled with despair. And, we will bring glory to Jesus, our bridegroom who lays down His life for our salvation. [i] Every believer, at the minimum, ought to be able to share the gospel using only the Old Testament.